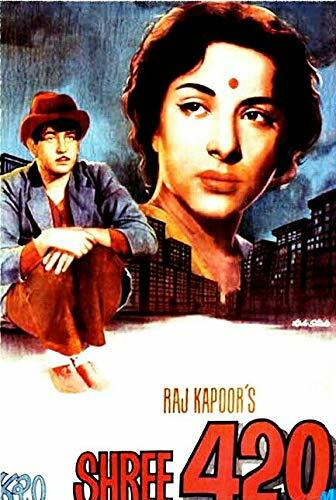 Description: Wearing torn Japanese shoes, English trousers, a red Russian cap, and a Hindustani heart, orphaned Ranbir Raj comes to Bombay to make his fortune. He pawns his gold medal, gambles with the money, loses everything, & the balance is pick-pocketed. He ends up on the beach, meets with Vidya Shastri, a teacher who runs a private school, and both fall in love. Ranbir gets a job in a laundry. When he goes to deliver some clothes to Maya, she notices that he has a way with cards, gets him to accompany her to a casino of sorts, where he wins Rs.20000/-, which unfortunately is pocketed by Maya. Then a rich industrialist, Sonanand Dharmachand, approaches Ranbir, hires him to work for him, and soon Ranbir is on his way to a wealthy life. Vidya gets a first hand look at this wealthy life, and decides to break up with him. Sonachand teaches Ranbir that in order to make money one must never discriminate between the rich and poor. So they set out to offer homes to the homeless for Rs.100/-. Watch what happens when Ranbir finds out that Sonachand has been setting him up to be the fall guy.Wearing torn Japanese shoes, English trousers, a red Russian cap, and a Hindustani heart, orphaned Ranbir Raj comes to Bombay to make his fortune. He pawns his gold medal, gambles with the money, loses everything, & the balance is pick-pocketed. He ends up on the beach, meets with Vidya Shastri, a teacher who runs a private school, and both fall in love. Ranbir gets a job in a laundry. When he goes to deliver some clothes to Maya, she notices that he has a way with cards, gets him to accompany her to a casino of sorts, where he wins Rs.20000/-, which unfortunately is pocketed by Maya. Then a rich industrialist, Sonanand Dharmachand, approaches Ranbir, hires him to work for him, and soon Ranbir is on his way to a wealthy life. Vidya gets a first hand look at this wealthy life, and decides to break up with him. Sonachand teaches Ranbir that in order to make money one must never discriminate between the rich and poor. So they set out to offer homes to the homeless for Rs.100/-. Watch what happens when Ranbir finds out that Sonachand has been setting him up to be the fall guy.